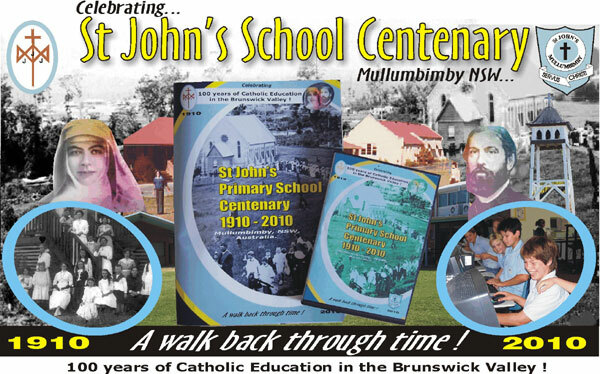 Centenary celebrations for St John’s Primary School, Mullumbimby, took place on June 12th & 13th, 2010. Over the weekend, ex-pupils and parishioners were treated to a display of memorabilia with photos dating back to 1907. Other items on display included class programs written by teachers, student work samples, uniforms, school bags, posters and school photos from each decade dating back to 1911. 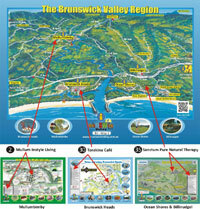 A Centenary Booklet entitled “A Walk Back Through Time” was produced for the special event. It contains over two hundred photographs along with a comprehensive history of the school and personal stories from ex-students, Sisters of St Joseph, ex-principals, parents and priests. A Centenary Cookbook, containing many favourite recipes from Parish families was popular with locals and visitors alike. The Centenary Dinner, held in the Parish Hall on the Saturday night, catered for two hundred & fifty people. School Principal, Mr Tim Bleakley was the Master of Ceremonies on the night with special guests including Mr Don Page, State Member for Ballina, Sr Mary Quinlan, Provincial of NSW Sisters of St Joseph, and Parish Priest Father Anthony Lemon. Cr Ross Tucker spoke on behalf of Byron Shire Council and Mark Russell, Centenary Committee Chairman thanked all members of the committee for the time and effort they gave in staging the event. Sr Anne Mills & Sr Michelle Condon, who are both ex-pupils of St John’s School also attended the dinner. A beautiful Mass, officiated by Bishop Geoffrey Jarrett was held on the Sunday morning. It was followed by morning tea and entertainment from St John’s students, consisting of choir items and the performance of bush dances. The Centenary Cake was cut by ex-pupils Marge Buckley, Mary Walker, Ruth Slattery, Bill Shay and Nora Porthouse … all of whom attended St John’s in the 1920s & 30s. After viewing the display of posters and digital images on video, visitors and guests had the opportunity to stroll through classrooms and admire the beautiful school grounds while the local Lions Club cooked sausages for a lunch time barbecue. All accounts suggest the St John’s Centenary Celebrations were a great success and have laid a platform for St John’s Primary School to continue its tradition of providing quality Catholic education for families of the Brunswick Valley.